Were you the first one to call it quits in your relationship? Were you the first to say, “I want to break up!” or “I don’t want to be with you anymore” and later, regretted it? Many times, people make mistakes in their relationship. They pick up unnecessary fights or stop talking to each other, and sometimes, they even go for hasty breakups in the heat of the moment. 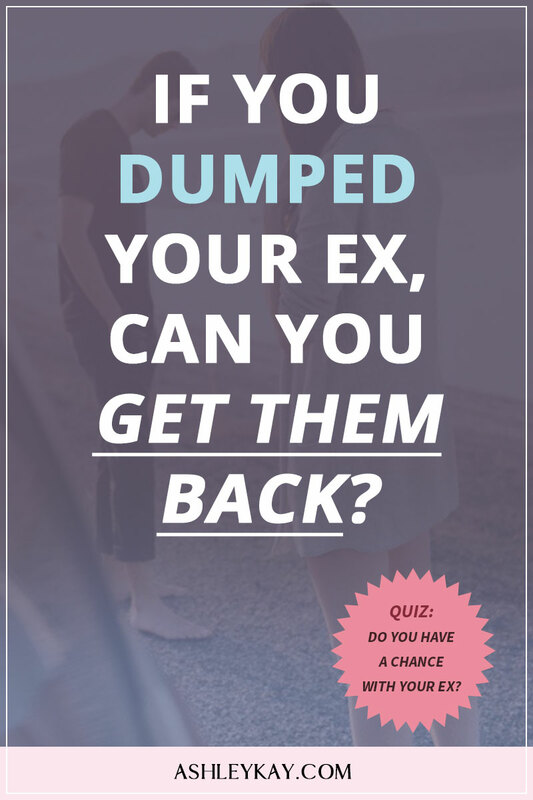 If you’re one of those people who dumped your ex, can you really get them back? Well, in this post, I will reveal the TRUTH about what are your chances are of getting an ex back, if you had dumped them. Not just that, I’ll also tell you about the 2 most crucial things you need to know if you want your ex back. First things first, the answer depends on the following situation. If you ex is an extremely prideful person, then your chances of getting them back are sadly low. This is because these type of exes hate to admit they’re wrong. They hate to be rejected and if they get rejected by someone, they hate going back to the same person who rejected them. So, it all comes down to whether your ex is an extremely prideful person or not. But wait, there’s one exception to this. If your ex genuinely did something terrible in the relationship and they know about it and feel bad about it, then you can get them back. For example, maybe they cheated on you, maybe they didn’t take you seriously or didn’t treat you right. That’s the really important element – the knowledge and the remorse about something they did wrong in the relationship, which actually justifies them being dumped by you. Without this remorse, your chances of getting them back are low. With that said, there’s a whole lot of people out there, who are NOT prideful in nature and will often feel some kind of guilt about a wrongdoing of theirs in the relationship. As long as your ex feels bad about something wrong they did in the relationship or something better they could have done in the relationship, then you can definitely get them back. So, if your ex isn’t prideful, it’s easy to get them back right? Especially if you dumped them. Yes, your chances are higher, but wait a minute. Before you jump to hoping out hope for that person. Let’s consider a few things. Now, even though your chances are higher, you still have to be careful here. Since you’re in a unique situation, there are some special conditions attached when you want to “undo” dumping someone, this is pretty important. RULE #1: Never ever utter or hint at or go anywhere near the words “break up”, unless you mean it 110%. Once you say ‘break-up’, that’s the end of it. Because, it becomes so much harder to get back an ex after you’ve dumped them. This part is really important for you if you’re a kind of person who acts before you think or jumps before considering the implications of your actions. Because, chances are high you’ll end up changing your mind and dumping your ex again! So, it’s really important to know yourself well. For example, you may change your mind a million times if you’re riding high on your emotions. So, in one moment you may decide to break up and then regret it, the very next moment. So, don’t be hasty in such situations. Give yourself the time to really think about what you want to do. Just let it marinate for a bit before you express it. If you really want to be out of a relationship, you better be sure about it. RULE #2: Know why you broke up in the 1st place and have a really good reason about why you want to get back together again. If you want to get an ex back because you feel lonely or you miss hugging a warm body at night, those are not good reasons. The core issues in your relationship will still be there. They’re not going to suddenly get resolved just because you took some time off by breaking up with your ex or disappearing for a little while. That doesn’t really resolve the issues in your relationship. So, you really need to be honest with yourself here. Really think about why you want to get back with your ex and find the right reasons. Your reasons have to be better than you not wanting to be single or wanting someone to cuddle in bed at night! You don’t want to fall into the trap of dumping your ex – regretting it and getting back together with them – then, again dumping them and so on and so forth. It comes across like you’re playing games with them and it will affect the trust that other people have on you. It’s not just about the trust with your partner, but your relationships with others will also get hampered in this situation. People will start hearing stories about you and you won’t be regarded as someone who is reliable due to your habit of flipping in and out a relationship. This will also affect your future relationships because if your future lover or the next person you date gets to hear about this nature of yours, they will doubt you. It’ll make it difficult for them to trust your word. If you don’t take any of these rules seriously, you should just do everyone a favour and stay away from your ex, even if they’re the ones who want you back. So, I would really recommend that you give good thought to the reason why you want to get an ex back without rushing into it. Remember why you dumped them in the first place. Be honest. Have a good reason and only then, make an effort to get your ex back. Now that you know what to do, if you still want to get your ex back after you’ve dumped them and have the right reasons for it, grab my popular program The Ex Recovery System here. And hey, keep watching this space for more videos and content. I release useful relationship advice on weekly basis for my followers! Go any questions for me? Let me know in the comments section below and I’ll be happy to answer them! Previous Post: « Should You Be Friends With Your Ex? A Warning!